It is no secret to anyone that the Oregon Ducks had a memorable season with many different successes both as a program and for individual players. 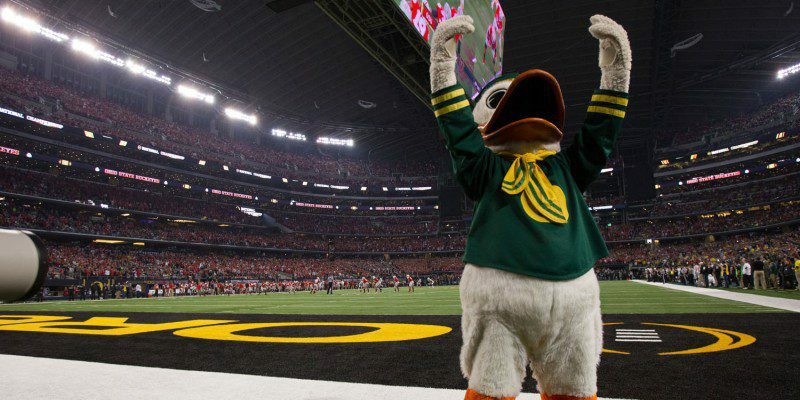 Although it is sad that it had to come to an end with a brutal loss to Ohio State in the National Championship Game, the Ducks should be considered a threat in college football for years to come. Especially in the upcoming 2015 season. In an article on bleacherreport.com, Jason Gold discusses five things that need to change for the Ducks to improve in 2015. 1. Toughness. ”The Ducks made significant strides in terms of alleviating the perception that they are “soft” this season. Wins against teams like Michigan State and Stanford, both of whom possessed top-10 defenses, proved that the Oregon football program is not one that can be pushed around.” This is a true statement, however, the “tough” Oregon Ducks team didn’t necessarily show up for the National Championship game. 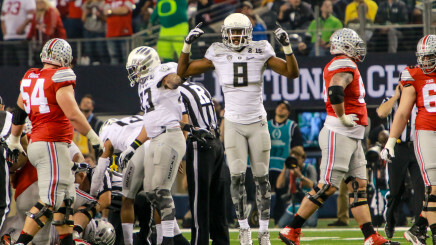 In fact, Ohio State practically bullied the Ducks throughout the game. At the time, the Ducks were ranked No. 2 in the country but they only managed to score 20 points against OSU, the lowest score for the Ducks all season. Their running game netted a meager 132 yards on 33 carries and they didn’t have a single rushing touchdown. The tough team that had been showing up on the field since the loss against Arizona wasn’t on the field that day. Now the Ducks have lost a number of players who were viewed as tough and dangerous, especially on the offensive side of the ball, so whoever is stepping into those slots needs to have their game face on for sure. Marcus Mariota in his Ducks uniform for the last time. 2. Who’s the Quarterback? ‘There’s no way to replace Marcus Mariota. The only reason the quarterback position needs to change next season is because Mariota is making the jump to the NFL.” There is no truer statement, Marcus Mariota is simply irreplaceable. Not in terms of talent specifically, just in general. Regardless, he is gone and it’s onto the next for the Oregon Ducks QB position. The Ducks have several options, in fact they have about six. Interestingly though, the Ducks’ offense is a team that has always been successful in past years running the ball. The 2014 season is the first season that they didn’t rank in the top 10 of rushing offenses. Although it will be a difficult adjustment for the offensive men with the ball in the hands of a new QB, he really has no choice but to be successful as he will be surrounded by incredible talent. The QB options for 2015 are Jeff Lockie, Morgan Mahalak, Ty Griffin, Taylor Alie or incoming freshman Travis Waller. Mariota hands the ball of to Freeman in NFC. 3. Rushing Attack. “Oregon ranked in the top 10 of rushing offense every year from 2007 to 2013. However, in arguably their best season in program history, the Ducks finished No. 22 in rushing offense in 2014.” Now, this is an interesting statistic, however, when a team is working with as much talent as Mariota possessed, they really have no choice but to play to his skill-set. Rushing or passing, the Ducks had an incredible season when the ball was in their hands. Going into the 2015 season though, the run game needs to be more focused. Thankfully that shouldn’t be a problem for the Ducks as they have two powerhouses returning next season who could run the ball for days. True freshman Royce Freeman will be returning for the Ducks after having one of the best seasons in Oregon football history. Over the course of the season Freeman ran for 1,365 yards and had 19 touchdowns. As far as talent goes he had a comparable season to Kenjon Barner and LaMichael James as freshmen. Alongside Freeman will be returning junior Thomas Tyner. Although Tyner wasn’t on the field much this season due to injury, he came back at the end and had one of his best games in the Rose Bowl. He will be coming back stronger and hungrier than ever for the 2015 season. 4. Third Down Defense. ”In all, Oregon faced 242 third downs defensively last year and allowed 102 conversions, which is a 42.15 percent conversion rate.“ The Ducks actually faced the most third down attempts in the nation and allowed the most conversions. Interestingly enough, the Ducks have been in the top 10 of most third-down situations faced in the last six of seven years. The Ducks definitely have some adjustments to make in their defensive play during the off-season, especially considering they no longer have Arik Armstead, Tony Washington, Derrick Malone, Ifo Ekpre-Olomu, Troy Hill and Erick Dargan. “The Other Number 8” Reggie Daniels in the NFC. 5. Pass Defense. 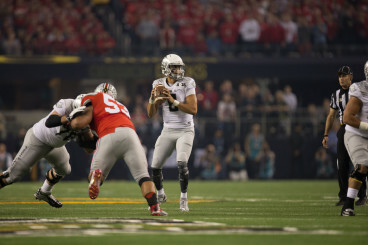 “Despite the fact that Oregon led the country in turnover margin and ranked No. 3 in turnovers forced last season, the Ducks secondary was atrocious for long stretches of the season. Oregon’s defense as a whole created 34 turnovers; however, only 13 of those came via interceptions.” There are various teams in college football that have quarterbacks that will willingly put the ball in the air. When that ball is in the air, it may as well be considered in a “free zone”; it’s anybody’s ball. The Ducks are losing a good chunk of their defensive players who were so clutch throughout the season including Ifo Ekpre-Olomu, Erick Dargan and Troy Hill. But the Ducks are not losing all their great talent; Chris Seisay, Arrion Springs, Reggie Daniels and Tyree Robinson will all step up in the 2015 season to fill the shoes of their former teammates. If the Ducks can make the adjustments necessary considering both the players lost and players gained (or already existing players coming off the bench), they will have a successful 2015 season. Of course there are going to be new obstacles to overcome but keep in mind, every college football team is going through similar obstacles in their off-season. Going into the 2015 season, the Ducks should be feared but at the end of the day the game itself is a “free zone”… it’s anybody’s game.